A hospital has lost 100 computer disks containing personal information about patients. North Wales NHS Trust is carrying out a review of its data security following the incident at Glan Clwyd hospital in Denbighshire last month. The disks, which were to be destroyed, are believed to have been disposed of "inadvertently" with other waste. The trust said the disks would have been crushed and buried in landfill and the information could not be retrieved. 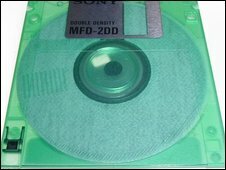 "The disks contained old data, from the period 1995 to 2005, which no longer needed to be retained," said a trust spokesperson. "The information commissioner was informed and a full investigation carried out. This investigation has concluded that the disks were inadvertently disposed of with other waste, contrary to trust policy. "Discussions with the trust's waste disposal company have confirmed that the waste consignment would have been crushed and buried in landfill and the trust is confident that the information could not be located and retrieved." The trust said it had reminded staff of the importance of "taking great care and complying with trust policies on all matters relating to the collection, use, storage and destruction of sensitive information". The data, which related to patient discharge summaries, was not believed to have been encrypted or password protected and was disposed of during an office move. The independent health watchdog Healthcare Inspectorate Wales said it will not be holding an inquiry into the disappearance of the disks. A spokeswoman for the Healthcare Inspectorate said they'd been contacted by the trust last month and had offered to provide advice with an internal inquiry. She added: "We don't plan to take any further action in this matter given the trust's own actions in response to the situation." A Welsh Assembly Government spokesperson said it took the issue of patient records and patient confidentiality "extremely seriously". "The trust immediately informed the information commission and launched a formal investigation into the incident, and has taken action to reduce the risk of such an occurrence happening again," said the spokesperson. "Senior assembly government officials have called for the findings of the review and action plans." A BBC Wales investigation last year uncovered more than 150 separate incidents where confidential NHS details could have been compromised over a three-year period. The North East Wales NHS Trust had 53 cases where patients' case notes were lost or stolen. North Wales NHS Trust was formed in July last year following a merger between Conwy and Denbighshire NHS Trust and North East Wales NHS Trust.